​SurveyGold Mobile makes it easy. It's is a free application that is available to anyone, by invitation-only, from a survey author who sends the email invitation via their SurveyGold application. You are a survey author. You need to conduct a survey using multiple surveyors with tablet computers who will engage respondents in-person, face-to-face. SurveyGold Mobile solves the problem of how to create and deploy a survey to a network of field surveyors using table computers. 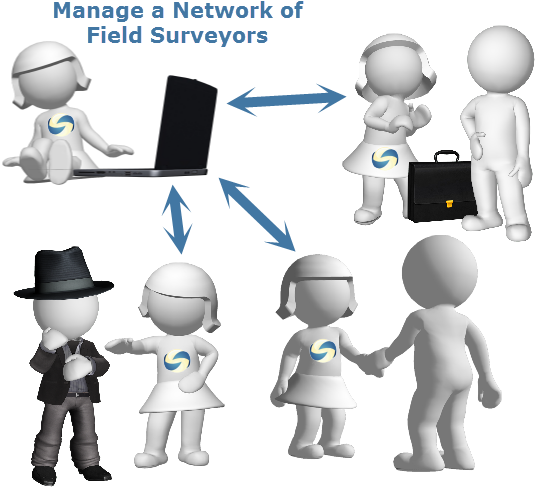 These field surveyors are your colleagues who use the free SurveyGold Mobile application to collect responses to your survey by engaging respondents in-person, face-to-face. Distributing the survey and collecting responses is a breeze. All you need as a survey author to make this happen is the SurveyGold application and Premium or Ultimate SurveyGold subscription. Use as many field surveyors as you like because the SurveyGold Mobile is available to all of your field surveyors for free.